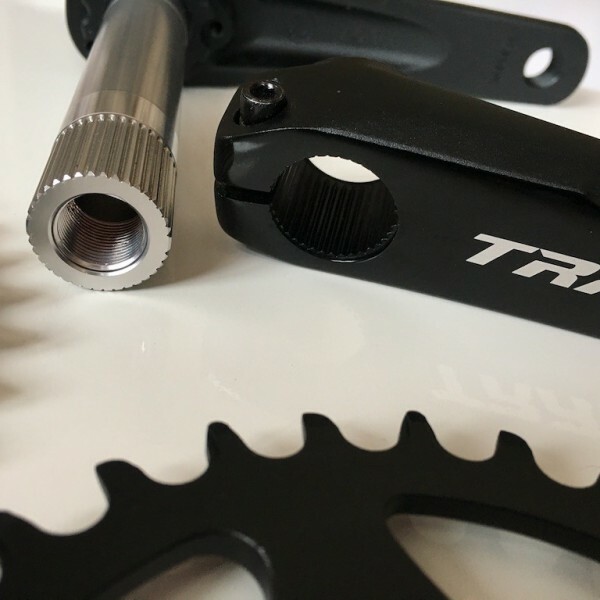 140mm Direct Mount Cranks will be on Back Order until 4/8. Cranks come complete with your choice of chainring size, spacers, spindle bolt and aluminum bottom bracket to fit any threaded 68/73mm bottom bracket shell. 49mm chainline, 168mm Q-Factor. 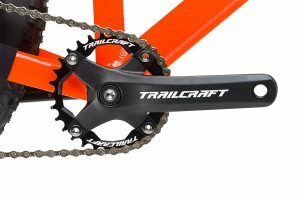 Trailcraft Cycles high performance aluminum cranks feature a direct mount interface with 26, 28, 30, and 32 tooth narrow-wide/drop stop style chainring options. Our new direct mount crank system typically drops 150 grams or more off a traditional stock square tapered setup and allows way more gearing options never before found on 127mm, 140mm, 152mm, and 165mm crank lengths. We love this setup so much it is now a stock option on all of our complete bike configuration builds - and now also to riders who want to make a current bike you own lighter! This is an incredibly light and stiff high-performance crankset. With 26, 28, 30, and 32 tooth options you can now dial in the perfect gearing for super steep riding terrain. The crank arms are forged and use a BSA (Shimano standard) 24mm spline interface spindle CNC machined from 7050 aluminum alloy. Removable 3-bolt direct mount ring design offers the ability to quickly change different chainrings depending on your next ride location or race. This is a complete system of crank arms, bottom bracket, and your choice of chainring size. These cranks will work on all standard 68/73mm threaded bottom brackets shells. Additional chainrings may be purchased separately. FUTURE PROOF! If you want to go bigger than our 32 tooth, our direct mount cranks are compatible with other brands chainrings using the common spline attachment system and 6mm offset spacing (49mm chainline). 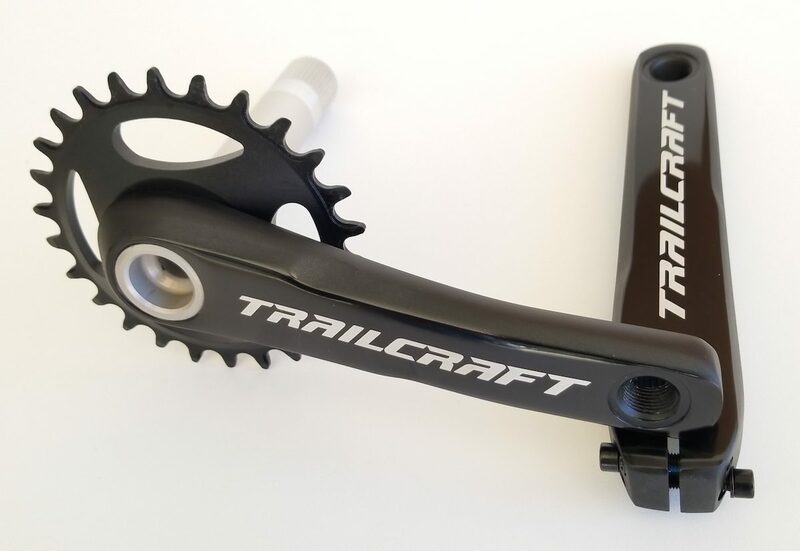 Trailcraft Cycles high performance aluminum cranks feature a direct mount interface with 26, 28 and 30 tooth narrow-wide/drop stop style chainring options. Our new direct mount crank system typically drops 150 grams or more off a traditional stock square tapered setup and allows way more gearing options never before found on 140mm, 152mm, 165mm crank lengths. We love this setup so much it is now a stock option on all of our PRO level bike configuration builds - and now also to riders who want to make a current bike you own lighter! Cranks come complete with bottom bracket, spacers and spindle bolt to fit a 68/73mm bottom bracket shell. 49mm chainline, 168mm Q-Factor. Cranks come complete with bottom bracket, spacers and fixing bolt to fit a 68/73mm bottom bracket shell. 49mm chainline. Trailcraft rocks! l’ll be sure to share my love with other petite cyclists and folks with kids who want a real riding experience. Direct Mount cranks are superior fit and finish, easy to install and plenty stiff for this gravel riding adult. My 152mm crank arrived nicely packaged and, thanks to easy to follow installation instructions, I was out riding in less than 30 minutes. I’ve been scouring the US for a crankset offering conversion ease, one that’s strong, light without the big name boutique price tag. Trailcraft answered my call -what a gem! Our youngest son is at a tough age for mountain biking – outgrowing his 24″, still too small for 27.5″, and most 26″ bikes on market are tanks. Enter Trailcraft. 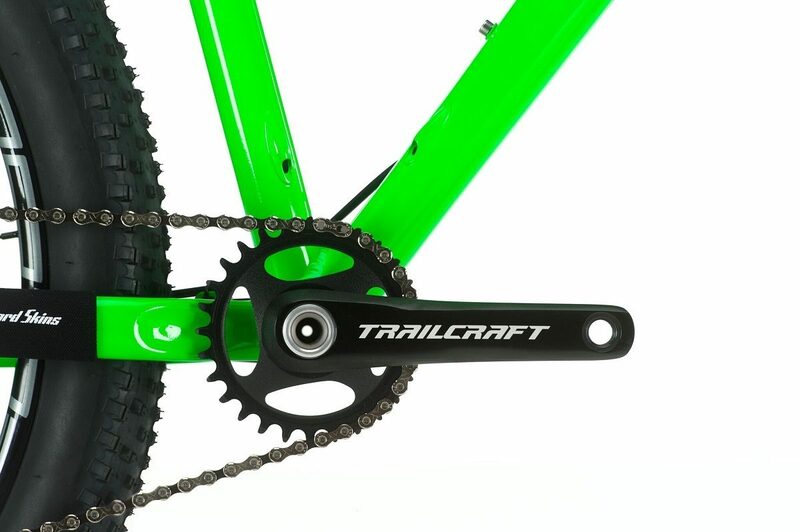 We decided to build a 26″ hardtail for him, and the Trailcraft direct mount crankset fit the bill perfectly. 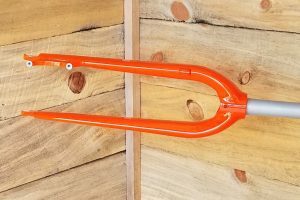 Light weight, quality build, and with the crank arm length and tooth count combination to enable us to use a 1×10 drivetrain. We chose the 28t chainring so he could climb without his spirits breaking. Kids have the most fun going downhill, but now he even enjoys getting to the top!! We also added the junior saddle, and it fits him great and is also light. Thank you Ginger and Brett for the quality products, great service, and for understanding what the kids need.